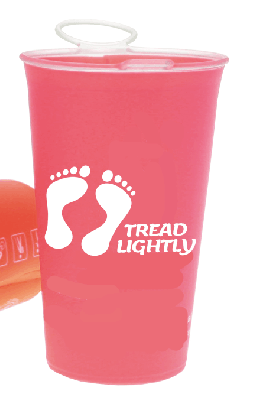 The Eco-friendly reusable collapsible trail run cups for cup-less trail run events. BMC Soft Cup perfect for any of your trail run races, the soft cup is easy to stow in any pocket and has a loop to clip it on your hydration bag etc so you can easily access it. These cups help reduce the waste of plastic cups. Made of TPU material Used for specific properties like -elasticity, then comfort close to the back -transparency, to clearly see the water level inside -resistance to any liquid, then taste free -PVC free, then no toxic substances reject when recycled Thermoplastic polyurethanes are perfect for bladder and tube. Top shelf dishwasher safe but not recommended for durability.